So it’s officially spring, although it actually feels more like summer right now with this heat in Jozi. And just as I swap around my winter clothes for my summer ones, it’s time I swap my facial skincare products around too. As you know, I’ve been using the same product line for years on my skin. They’ve rebranded most of the products I use and they’re now called Johnson’s Daily Essentials. I always prefer to stick to the same line across my routines (from hair to skin to body) as I believe they work best when they’re all part of the same family. If you have skin like mine that behaves differently in different seasons, continue reading for my spring and summer time routine. In the colder and drier months, I like to use the Daily Essentials Day Cream. The formula contains glycerin and shea butter, which is perfect for when autumn and winter air are so harsh on my skin. It’s thicker than the cream I use in summer but it’s not greasy. It’s also got an SPF of 15, because you still need protection in gloomy winter. Every year around this time, I swap this out for their Even Complexion Day Cream, which is a lighter lotion perfect for summer. So now we’re heading straight into summer, I use the Even Complexion Day Cream. My face gets way too greasy if I use sunblock on top of my lotion, so I love that this one has an SPF of 15 too. The formula is light and doesn’t feel like it’s sitting on my skin so it still feels like it’s breathing. 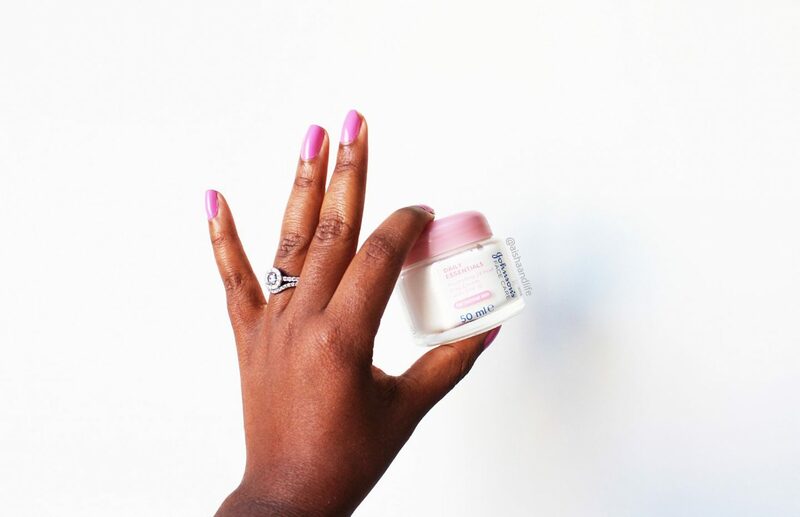 And when I travel home to hot and humid Tanzania, this is also my go-to face lotion. The Even Complexion range helps to reduce the appearance of dark marks and blemishes, which I have a few around my chin and neck. I can’t live without an exfoliator. Wearing makeup every day and just the general exposure to all sorts of nasties being out and about means that I need a regular scrub. Of course, it’s not a good idea to scrub your face every day, but the Johnson’s Daily Essentials Exfoliating Facial Wash is great because it’s gentle enough to use every day. It also has a mild and fresh scent. Score. The entire line works great as a system for me, and that’s why I haven’t budged to anything else for years. 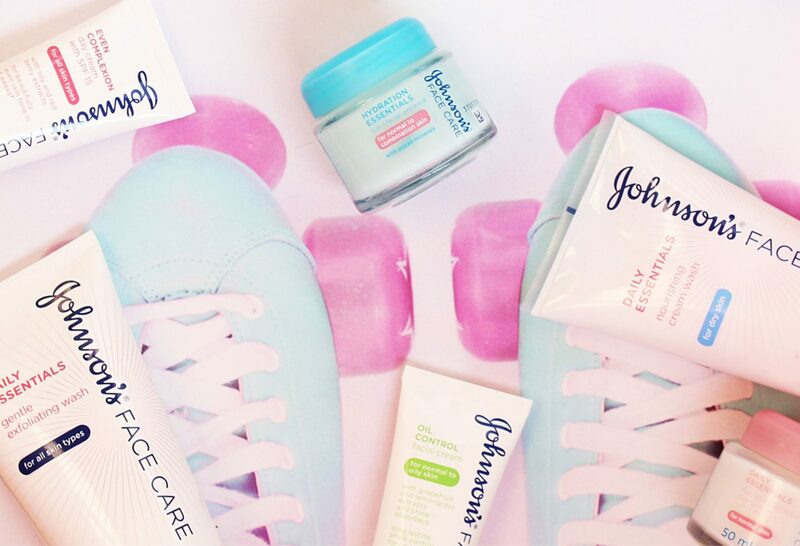 WIN A Johnson’s Daily Essentials hamper! Now that I’ve shared my spring skincare must-haves, you can also treat your skin to some of these goodies. You can WIN a Johnson’s Daily Essentials hamper, suited to your skin type, worth over R300! In the comments box below, name one Johnson’s Daily Essentials product you can’t live without. Johnson’s Daily Essentials Cleansing Wipes really are my favourite ,it cleanses the skin so gently. Johnson’s Daily Essentials Cleansing Wipes really are my favourite and I cannot do without them. I carry them to campus, during hot days, I whip them out and cleanse my face. You know in University, you come into contact with a lot of people and things then you will bring all that dirt to your face. The wipes make a stop by my hands before rushing up to my face. They smell so good and leave my face feeling clean and oh so soft. Oh oh, eversince I started using them, I no longer have to apply petroleum jelly around my eyes to remove cheap mascara and eyeliner. Make-up simply glides off my skin with these wipes. They are versatile, I love them. Johnson’s Daily Essentials Facial Cleansing Wipes are a must for me! They are gentle, removes all makeup and does not leave my skin dry. They are great if I just want to freshen up my face during the day – without doing the whole haul…. Come in very handy after a night out or when I am just lazy to do my whole night time routine! The Johnsons daily essential facial cleansing wipes are a must for me. They are gentle and removes all makeup without drying my skin. They are also great for when I just want to “freshen” up my face during the day without going the whole haul….They come in handy after a night out or when I am just too lazy to do my night time cleansing routine. It would definately have to be the Gentle Exfoliating Wash. With a toddler I don’t have a lot of time to myself so this product is basically a two in one. Cleanses and exfoliates in one go instead of using different products. Johnson’s Even Complexion Day Cream, I just cant leave without it otherwise my days would be so long. If Johnson’s were to discontinue the Even Complexion day cream with SPF 15 for all skin types, it’d be the death of my newly discovered confidence. Before trying the cream, my face was a not so pleasing sight to me:dark marks left by hyper pigmentation and sunburn,acne and one incidence of chicken pox. It was really difficult finding one product that can make a difference and as a result my self-esteem decreased by the minute. I discovered the cream about a year ago and nothing else really matters now. I apply it each and every single day and love how it smoothly stays on my skin without leaving any residue or grease. The marks have all faded and the glow is so hard to ignore that it even gets my colleagues often asking if I have make up on! I am even toned and much more in love with myself. The one secret I can wholly share with everyone is that patience, healthy eating and regular intake of water also go hand in hand with using facial products. Thank you, Johnson’s, for bringing me back to me. I can’t live without Jonhson’s Daily Essentials Gentle Exfoliating Wash, cause not only does it leave your skin smooth and soft. It also gentle washes away impurities on the skin, in my case it’s the dirt left there from whatever my 19 month son just ate. Cause when he’s done eating, he always reaches for Mommy. I honestly can not live with the facial Cleansing wipes. My face lets out old most of the day. And I don’t like my T areas very oily so the cleaning wipes helps my clean up those areas. I also love the fact that I can carry my wipes in my school bag. So anytime I can keep fresh and clean. All thank to my mother who introduced it to me. 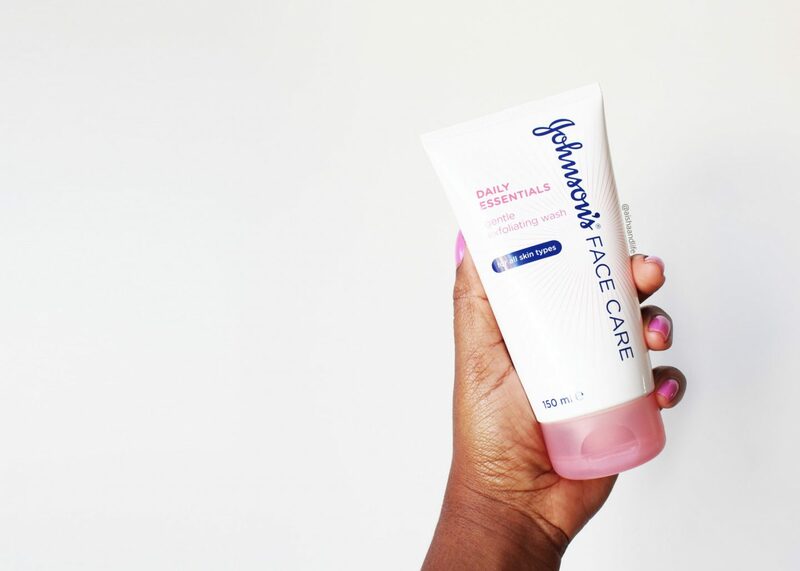 Johnsons Gentle Exfoliating Wash and the Johnsons Essential Facial Cleansing wipes is a must in my home amongst the other Johnson range that my daughter uses from the Johnsons Aqueous Cream to the Johnsons Baby Powder. The day cream is the one for me, I feel like the hardest part of skin care comes after you wash your face, cause if you use harsh moisturizers and creams your skin fights back and if you use something oily you break out and so this is the perfect in between where it is moisturizing and conditions not too oily and not harsh either. One Johnson’s Daily Essentials product i can’t live without is the facial cleansing wipes!! These are life. I love make up and i use it everyday. I use these wipes and they remove my make up perfectly, before i remove my clothes, we all know how makeup gets on clothes:( They leave my skin still feeling refreshed, not dry. On those days when i am feeling too lazy to do my nightly facial routine, i just grab my wipes and they do their job. I have tried a few brands but this one is the best as i don’t get any reactions from it!! I would recommend this any day. I simply cannot, for the life of me, live without my Johnson’s Daily Essentials Nourishing Day Cream Normal. It last’s 24 hours, leaving my skin feeling silky soft and smelling great. Besides, my significant other LOVES how soft my skin is so I’m always getting forehead kisses and little “i love you” kisses on the cheek and who doesn’t love these little cute things. I cannot live without my Oil Control Wash and Cream. My face is oily and horrible looking when I don’t use it. Keeps my skin fresh and clear. 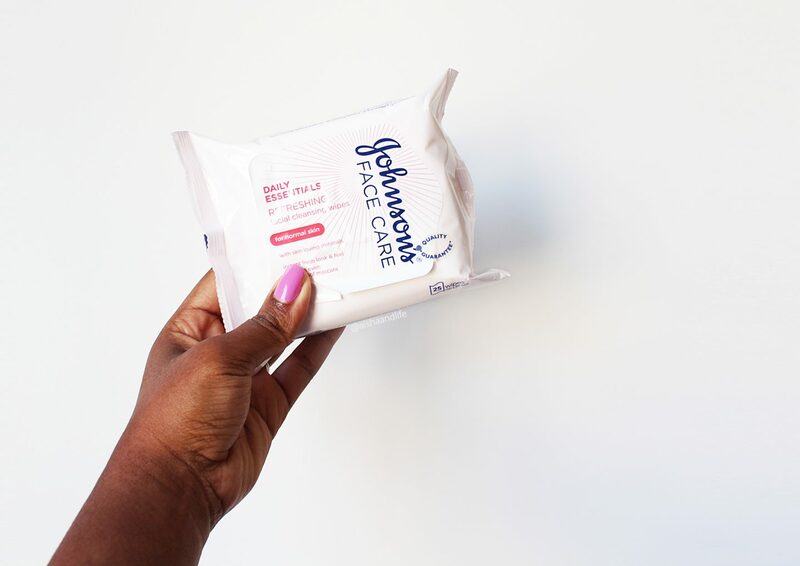 Johnson’s daily essentials facial cleansing wipes are the bomb! It’s super handy and versatile and also so gentle. This wonderful product is perfectly suited for my skin, it applies gently and easily and is smooth as silk , its free of harsh chemicals and my skin is protected, nourished and healthy. It has certainly helped with my acne, no more clogged pores. Ever since I began using this product my skin looks and feels great. I love this brand and the wonderful products. The effectiveness of this Johnson’s Daily Essentials Gentle Exfoliating Wash is truly great and I am so glad to have a awesome blogger who is giving a hamper away. Thank you , keep up the fantastic blog and fabulous pics on instagram ….I am like your stalker lol, can’t wait to see what you are up to next. It does not dry out my skin. I absolutely love and its a must have for me is the Daily Essentials cleansing facial wipes. I have a pack for home, my handbag and car. Its so gentle on my skin and it cleans and refreshes my face. A wonderful product which I highly recommend. Thank you for a wonderful giveaway love your blog posts, reviews etc, I aspired to write my comment like how you write your product reviews…see the influence you have on me…an inspiration thank you. 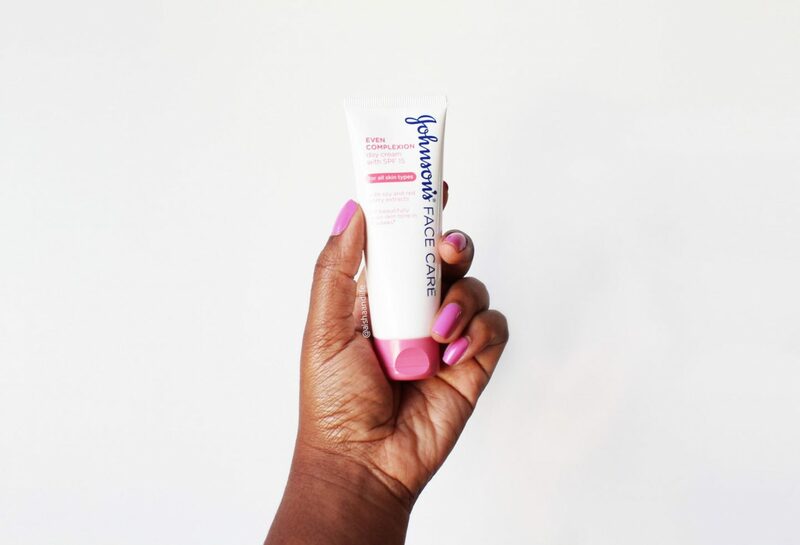 Being exposed to Polokwane”s blazing sun everyday…i most definately CANNOT live without Johnson’s Even Complexion Day Cream (for all skin types). The SPF 15 in it really helps and the fact that it is not greasy… ❤😍😗. I absolutely can’t live without the gentle exfoliating wash! My skin really loves it. I cant live without the daily cleansing facial wipes. You’ve really got me interested in the Johnson’s skin care range. I just went to buy the dry skin range, will try it from tomorrow. I figured since I use the aqueous cream to wash my face, I might as well try the essentials products. Couldn’t find the entire range in one store though, had to collect each one from different stores. But I am ready and armed to conquer my dry skin. Question… Do you use the night creams? Do they make a difference? So good to hear I got your interest 😉 I actually just got the night creams so will be using them soon. How’ve the products been so far for you? Johnsons Gentle Exfoliating Wash is the best. Skin feels clean and smooth afterwards. Johnson’s daily essentials facial cleansing wipes are the best thing since sliced bread. So handy, with multiple purposes and a must for my handbag and in my vanity cupboard I absolutely 💜💛💚💙 this product.